This popular ride is ideal for families and new riders or those who want a less strenuous pace than the longer countryside tours. You see a lot of Iceland, but at a pace that allows you to enjoy some of the most impressive sights in Iceland. Accommodations are simple but comfortable, in made up beds in farmhouses and guesthouse, and the hot tubs will be very pleasant after a day’s ride! There’s also a longer version - the Gokden Circle Tour is a little longer. Here’s an opportunity to enjoy the vast ice field of Langjokull glacier up-close! A 4x4 vehicle takes you to a base camp to change into warm gear. You’ll get the safety instructions and then we drive into the white world of ice and snow, on a 1 hour trip on to the glacier. Two people share a snowmobile and if you have a valid driver´s license you can drive! It’s over already!! After breakfast, you’ll bid farewell to guides, horses, and head back to Reykjavik. You’ll be here by about 10:30 AM, and the outfitter will drop you at BSI Bus terminal, where you can catch the Flybus which will return you to Keflavik Airport for your flight home. 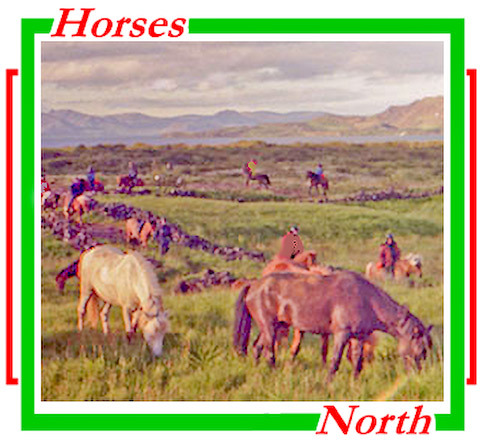 There is a longer, similar, tour called the Golden Circle Tour that has 6 riding days and covers this area and a bit more. The Geysir - Gullfoss Tour will run 12 times in 2016. Below are travel dates but we can arrange for you to arrive earlier or depart later. Your arrival day in Iceland is always a transfer day, which allows you to rest from the short night of sleep on the flight before you start riding on the second day.